Being Women – the Balancing Act is a series of candid discussions focussing on the women of today, who beautifully juggle work and family. We spoke with some of the most prominent women from the Indian Analytics Industry this INTERNATIONAL WOMEN’S DAY. We talk about concerns like Gender Diversity, Equal Pay for Equal Work, Coming back from Maternity, Being the only women in the Board Room etc. They share their experiences from being part of the industry, about what inspired them and who supported them. 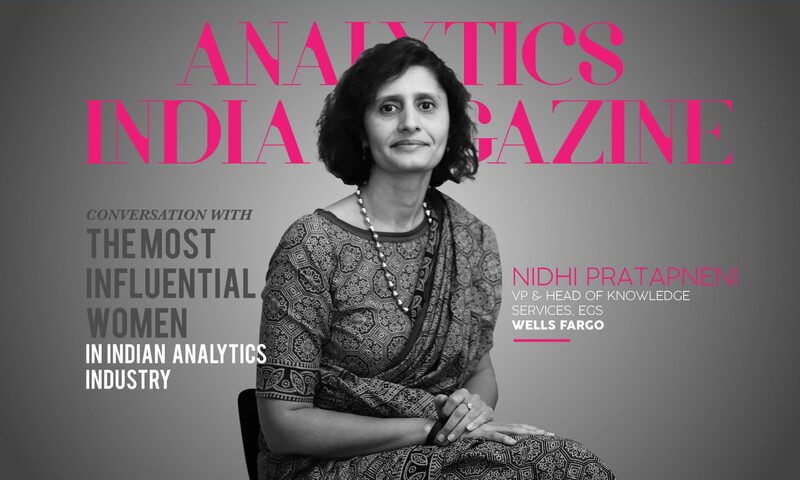 In the first of this series, we speak with Nidhi Pratapneni, SVP & Head of Knowledge Services, Wells Fargo. [dropcap style=”flat” size=”2″]AIM[/dropcap]Analytics India Magazine: As a kid, what did you want to be when you grew up? What was your childhood dream? NP: As you ask this question, I can think of many powerful women I could name… Indra Nooyi comes to mind. But actually, it has been my mother all along. She has been a working woman. She had a double promotion in school, went to Allahabad University and then to Roorkee. She was one of the first women studying Chemical Engineering there. She’s also someone who didn’t get into the IAS because she didn’t know where Fiji was! At least that’s what she thinks because she hated geography. After she retired she’s been devouring all these old texts by Ibn Battuta and other travelers. She has constantly been learning and that’s what really inspires me. If she’s been able to do that and is still doing it, there’s no reason for me to hold back in any way. NP: I feel leadership has become a much maligned/overused word. Everybody has their own style and I would say the style that defines me is one where I believe in being very open and frank with people. I want to convey to them that I’m accessible. My principles are based on my belief that I’m an enabler in making my organisation and my people successful. That summarises my mantra. When I’m not an expert in a particular area, I need to build a strong team where I can leverage others’ strengths and figure out what it is that complements mine. Creating an ecosystem that is built on our strengths is important. You have your strengths, you have your passions, go pursue them! Because in the end, the whole ecosystem will benefit. So it is not just “my way or the highway”. NP: It is hard to pinpoint specific challenges. I think one faces challenging situations and just goes through them. Perhaps if nothing stands out for me, there wasn’t a really huge challenge. My career has been a journey of pursuing a few goals and staying persistent. There are always setbacks.When you move back from the US to India, you think that everyone will welcome you with open arms. But that wasn’t the case. That was a setback, figuring out now that I’m here, where do I find my foothold? My classmates are doing great things. What do I do? So I think that was a challenge. Did people ask me how many people did you lead in the US? Well, in the US most mid-level managers don’t lead more than 10 people. To come back and face these questions from head-hunters was disheartening. Looking back, I don’t think that was a challenge but it was a tough period that I had to work through the normal ebbs and flows of raising the kids and building my career in parallel. I call it the GMS — the Guilty Mom Syndrome! PMS, GMS you know! It characterizes women quite well. NP: I feel that I’ve been very lucky. I’ve worked with people who have been very helpful, very respectful. Part of it probably comes from the places I’ve been, and they acknowledge that. ‘If she has worked in XYZ places or been to certain institutions, there must be something to her’. It is a stereotype that has worked in my favor. It works against people in some situations. Having worked in MNCs all through, finding people who’ve been there to guide me and advise me, I found peer interactions quite professional and rewarding. Although if a woman from the US were to come in my place, perhaps she would feel that there are sub-texts and prejudices within the corporate ecosystem that I don’t sense because I grew up in this world. Subliminally, maybe I accept certain stances because I belong to this culture and accept some of its ways. But truly, I found a lot of acceptance. (In non-work professional environments) I do feel that women should want to project themselves through platforms and opportunities like the ones you offer. There is a dual dynamic where a) women won’t step forward and take those opportunities and b) to some extent they are not even invited as much as they should be. Maybe we should do some statistics on how many panel discussions are held in a year and how many women panelists are featured there? I’ve been to a forum organised by NASSCOM in Hyderabad which was only for women. And I asked myself why should it be a women’s only forum when what you are talking about is Big Data? What is it about big data that makes it a women-only forum? But people do feel that a lot more women participate in those events. Even though there’s nothing that is going to be discussed that is pertaining to gender. So maybe some of those are needed. Maybe there is an explicit need to also protect women in those panel discussions as presenting a different perspective, to say that there are women who have a seat at the table. So that those in the audience find that very normal and can think of themselves in those roles. NP: I think there are two aspects. There is a tech industry segment of predominantly MNCs, those who are more forward-thinking and where there is a definite commitment towards gender issues. And then there are many other smaller shops where there is more scope for discrimination. There isn’t much vigilance to ensure equality. In the MNC environment, there is definitely a commitment to equal pay for equal work. In reality, though, it may not always hold true and there are many nuances as to why it’s not happening. Part of it is that women will not negotiate much, and this is something that I learned late in my career. That it’s okay to have those discussions around compensation when you are being made an offer. I feel it is harder (even now) to do that negotiation while I’m in a role because once I’m in it, the system should give me what I deserve. But at the point at which you are being made an offer and you need to negotiate, many women will not do that. There is a sense that “my husband is the primary earner and whatever I’m getting is over and above that, why fight for it”? So Equal Pay for Equal Work needs to be driven by both dimensions. I think women should be more empowered to ask and organisations need to develop systems where they are tracking it, analyzing it. Whether people in the same role are getting the same or not. If they are not, ask why. It may still be okay – one can’t push through and say equal work-equal pay when the woman might not be as good as a performer as the man. So all of this needs to be done but not at the cost of making excuses for somebody’s performance. It has to be merit-based. AIM: What are the issues women face when coming back from maternity? NP: That’s a big one. I’m almost 13 years past that time, but I think it is very relevant. It’s not something I went through here; my personal experiences are from the US. For a woman who wants to work, she has to overcome that guilty mom syndrome and how do you overcome it? You need the support of your workplace that you’ve been part of and you need support from your social ecosystem, your families, and friends. Your family should be supportive that this is something that you need to do. You don’t want the guilt to be multiplied two or three times when you decide to get back. Your husband has to be supportive. And the organisation concerned must think about what role you come back in. And ask you what are you comfortable with. There are policies that do get made, at the same time there has to be a very individual conversation on what’s right for this particular person. There are discussions one is part of where you hear that someone’s raise is scaled down because she was on maternity leave for some time. In those conversations one needs to actively educate people to say that during that period the person is an earning team member – you need to drill that education into both male and female managers. So there are a lot of dynamics at play. It’ll be a while before we get it perfect. I think there are some women who have had a great experience coming back from maternity. And possibly in organisations it would be great to showcase those women and those learnings for others to make it an easy transition back to the workplace. NP: For both men and women, working or otherwise, it is work and family rather than work or family. It’s just that society becomes a little more preachy when it comes to women. People will appreciate women who achieve things, who win acclaim. When it’s your friend’s daughter who is featured in a newspaper, the father may go, “Oh look she’s in the newspaper and she’s done all this great stuff”. But when it comes to his own daughter or daughter-in-law it might be, “Well you just had a child. You need to give the child four or five years”. I don’t think people realize that they are being hypocritical. How do you educate them? And you have to because you need the support of the same people who seem to be pulling you back! Women need to realise that perhaps they can’t be perfect at both. You can’t give your 100% to both. “Do you do a 50-50 or do you do a 70-30 at one time and then switch it around to 30-70 at another time?” Those are ways that one needs to decide for oneself. Each person has to chart their own course and what works for them. NP: It’s been great to have my husband support me all through. He understands a lot of the challenges that people face in organisations and is able to share his own perspective, advice on how I am navigating or not standing up and saying no to certain things. It’s been a great partnership. On the family side, it’s been either my in-laws, who have been with me for quite some time or my parents who have been always been there when I was in Gurgaon. They were there to step in whenever I needed it. So leveraging the family support system has worked very well. Have a plan A, have a plan B as well and have people in your family who are there to support you whether if not physically at least encouraging you from the back lines. NP: I’m not sure which barriers but there was an instance which was a turning point for me. This was when I was working in India after I had moved back. I was doing the work of three people. I was managing a team of 20 people, two of the other leaders had moved out so I was managing Asia and Europe and also the role of the person who was supposed to supervise both of those. So I killed myself doing it. Enjoyed it a lot and I felt that people should be taking notice that I’m achieving this great feat, addressing any fires that come up without much of an issue. And when it came to the next stage of saying okay, now what do I get for it? It was pretty much nothing! Somebody else was being brought in to lead the team and this was a professor who had not managed teams at all. So I’m like here I am who’s been running this business all through and now you want someone else to come lead the team! Where does that leave me? So kudos to the person who did come in though, because after I finished my transition I sat him down and said, “Look I’ve told you about all the team members now you need to listen to my story.” And then I shared with him my struggles and frustrations and he was extremely supportive, and he said let me figure out why things didn’t work out and get back to you. He became my partner and actually coached me and told me, “Look here are the three things that I’ve heard…” And in the end, I was the one who took the lead to say, “They want to see ABC things. Here’s what I am going to do.” Because nobody was telling me what to do! You realize that there are seniors and leaders out there and yes, while they are great in their own roles, often times they are so busy they have no clue. It’s great for you to take your destiny into your own hands and say “OK…here are the seven things I am going to do. Let me know if you agree with them or not”. Once you have the agreement and support, then you can really chart your course and say – I have done all of this, now do you have any hesitation? And so I was able to move on to next level. That was an instance where I pushed the barriers. I had conversations which were very tough. It was tough for me to hear the feedback as well and tough for me to initiate conversations where I put myself ahead of everyone else. But it did work out and it was a huge positive. That’s one advice I give to many people that I mentor or speak to. You build the things that you want to because that’s where your heart is. Better to follow your own passion than wait for instructions based on what someone else is interested in. NP: My family – my parents, my in-laws my husband. My children now that they are much older, are able to take care of a lot of things themselves. But I think on the professional front, a huge support system has been a lot of the people I worked with and my peers and seniors over the years. I have worked in several different companies and in each company, you find people who you respect and it’s great that one is able to reach out to them for advice later on. So for example when I was in dunnhumby, there were a lot of youngsters in my team and now they are in senior positions and I look to reaching out to them to either get advice or if there are people who worked with them, for talent and hiring and bouncing ideas off of them. In Dell, there were several others. The one person who many people in Bengaluru know is Pankaj Rai and coming across him and just understanding the way he just advises people, gets them to think of the larger scheme of things was very beneficial to me. Learnings from people carry you through and you find that as you do this you build your network. As youngsters you’re told that networking is a bad thing, this guy is networking and oh he’s doing something he shouldn’t do. But when you build it gradually as a natural course then you realise that network does play a role. For example in Dell – this manager came up to me and said I’m looking for somebody to head my social media team. Would you want to do that? I had no social media experience. If I applied for such a job, nobody would give it to me. Here is someone who is willing to take me on because of what they’ve seen me do and so I said let me just jump at it, otherwise it’s not an opportunity that’s going to come again. So that was a result of that network and support system that I built. NP: I think many corporates have started moving ahead beyond the numbers. Some might still be in a phase where they are merely looking at a number of women in organisation. So you should be achieving those numbers but with an insistence that you are not compromising on quality. Then when you go beyond that, it is how inclusive are you making your environment for the diverse workforce. When you are driving gender diversity programmes, who is taking the lead on those and who is part of that conversation? If men are not a part of that conversation, then we are really doing a great disservice and we are not moving that conversation as fast as it could progress. I think it’s the responsibility of the women as well to also educate their peers. If it is a senior woman leader who is talking about her experiences and her challenges, if the male manager isn’t there, who will benefit from it? NP: I’ve started wearing sarees to the office very recently, only in the last 3-4 years. I am comfortable in them, but if I need to dress for an event I think wearing a saree would distract from the conversation if there are people who are not used to seeing me in a saree. I would want my message to go across rather than have people think, “hmm why is she wearing a saree today?”. I’ve been comfortable in suits. They will not raise that many eyebrows but for a woman who’s used to wearing sarees all the time, if she suddenly shows up in a suit, it will be a different thing. I think whatever you wear it’s the message that is important. Yes, it is important to put that effort into looking good and – whatever it is that you’re wearing – to feel confident that you are looking good in that boardroom. AIM: Your advice to other women in tech? NP: I would say ‘women in tech’ is a phrase that shouldn’t put you off. Don’t feel inhibited by it because tech is increasingly becoming a space that is valuing the arts as well. It’s great that we have reached this stage so I would say this message is not for women in tech, it’s for women in any discipline which will find a role in analytics. Business decisions impact the factors that play into how a consumer thinks, how a consumer behaves. Many of these are aspects of sociology and behavioural sciences. The second thing I’d like to say is that learning is constant. My generation grew up at a time when studying ended one chapter and working opened a new one. The lines were clearly drawn and one didn’t go in reverse. Today, we must constantly learn and keep ourselves up-to-date on what’s happening in terms of cutting-edge trends and technology. So I would like to encourage women to have a mindset that learning is constant. There was a recent statistic shared by Coursera, that of the people who take their courses, the percentage of women taking them is much lower than the percentage of men. That is probably because when women move into a phase where they have to juggle work, family and everything else in between, the ability to take time out to invest in yourself, to invest in learning is harder. Women tend to hesitate and wonder how they can make it happen and feel stuck. I would suggest that they figure out how to do that learning within their organisations in a more structured way. When it’s part of your work and is required of you, perhaps you will be forced to do it. Figure out what makes it happen for you because learning and up-skilling will be paramount in the age we are in. NP: A lot of attrition takes place when women need to focus on their family. Either when their children are very young or during the phase where they are in school, where they need more help. It’s important to encourage those one-on-one discussions with women. I’m not sure that it is happening. There should be an intent to identify those who are in the fragile phase and have specific conversations that say “This is why we are having a conversation. What is it that will make you more comfortable in terms of being able to balance work and other priorities that you may have and can we structure something for you?” It is harder to do in start-ups; operational economics become more important. But in many other companies, there is a greater willingness to do it. How you make that connection to realize it for your women employees is a bit of a question mark and I would encourage those one-on-one conversations and customizing work arrangements for women.